Strategically located within the financial center of Reforma, one of the most emblematic areas of Mexico City, surrounded by offices, places of interest and tourist attractions, Hotel Bristolcombines a classic atmosphere with cheap prices and services that both modern business travelers and vacationers can enjoy. The Hotel Bristol Reforma in Mexico City is a Four-Star hotel built in 1970, with traditional architectural style and decoration that elegantly blends classic, old and luxury details. Overall, our hotel in Mexico City features 140 accommodations divided into Standard rooms, Junior Suites, Suites and Penthouses, each option fully appointed with cable TV, safe box, air conditioning, Wi-Fi and more. 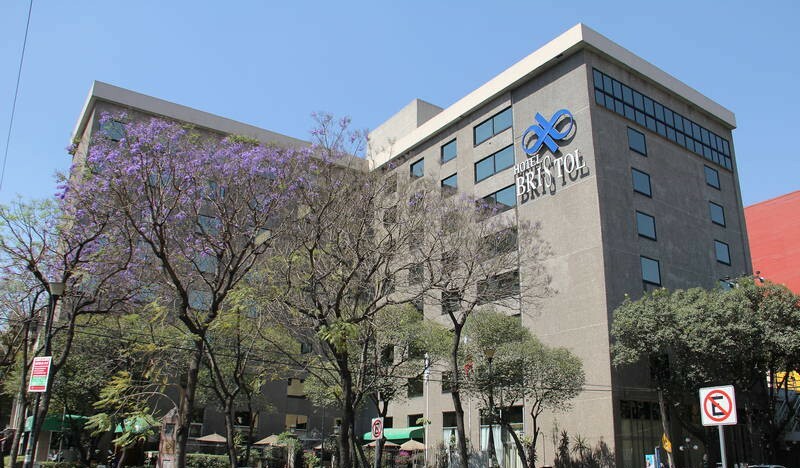 Undoubtedly, Hotel Bristol is distinguished among 4-Star hotels in Mexico City for its great location in Plaza Necaxa, at short walking distance from some important meeting points like the U.S. Embassy and the Mexican Stock Exchange. The Angel de la Independencia, Historic Centre, Plaza 222 and Monument to the Revolution are attractions located close to our hotel too.